Hanukkah is also known as festival of lights. 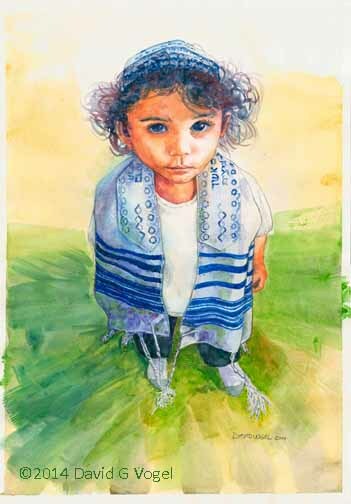 The Hebrew word (also written in English as chanukah) means “dedication” and marks an eight day winter celebration that commemorates the re-dedication of the Second Temple after a small group of Jewish believers (Maccabees) defeated their enemies. More at this link. 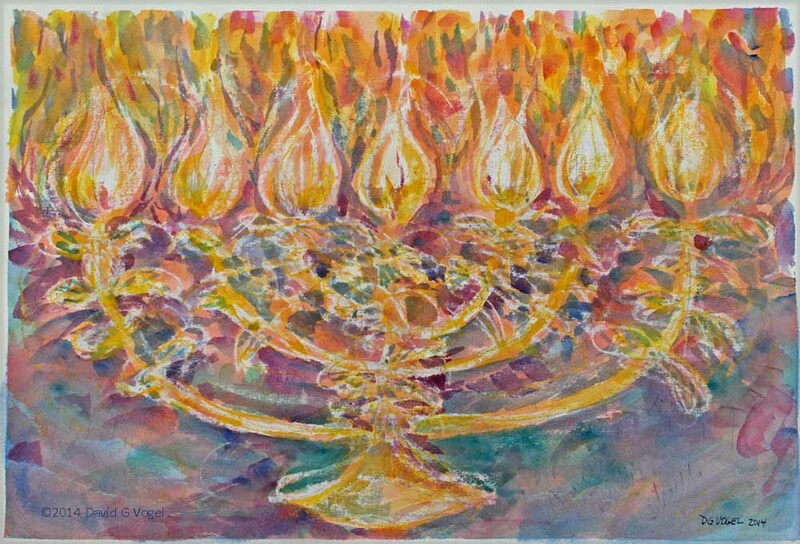 A “hanukkiah” is basically a menorah with nine candle staff to distinguish it from the menorah’s seven. Why nine? that’s part of the miraculous story. Then G-d said, “Let there be light!” and there was light. I have a collection of faces in my ancestors folder. Peter Johnson, my great- grandfather, immigrated from Sweden and lived in Two Harbors, MN. Less is known of the younger lady found in the box of heirlooms – possibly a close friend or distant relative? If anyone recognizes her please contact me. Favorite for their medicinal value more than the taste: garlic, avocado, ginger. this is one of the seven species mentioned as evidence of fruitfulness in the promised land. 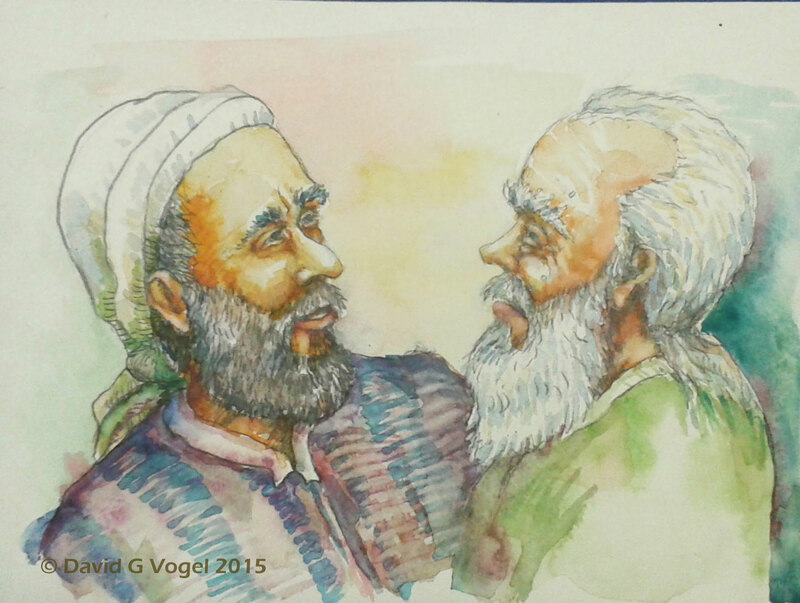 Friends have called this above scene two rabbis arguing, or two disciples, or two close friends. The pipe smoker is some literary figure I read frequently during my college years. Not that I call it finished, I just experimented with a quick sketch and dash of color. re-post of a friend’s 3-year old child, one that I couldn’t resist doing for them. sometimes I try a different style, and do it quickly to see where it leads. starting with the earlier idea of light being ethereal, this was done on rough paper using crayon to pull out the highlights before applying watercolor– a wax resist technique. I envisioned it through a water-soaked lens as the lights played on reflections. eventually I gave it as a wedding gift for friends. I like doing portraits. here are a handful of black and white drawings from the past year or two of interesting people I’ve run across. contact me if you would like something done for your friends or family.